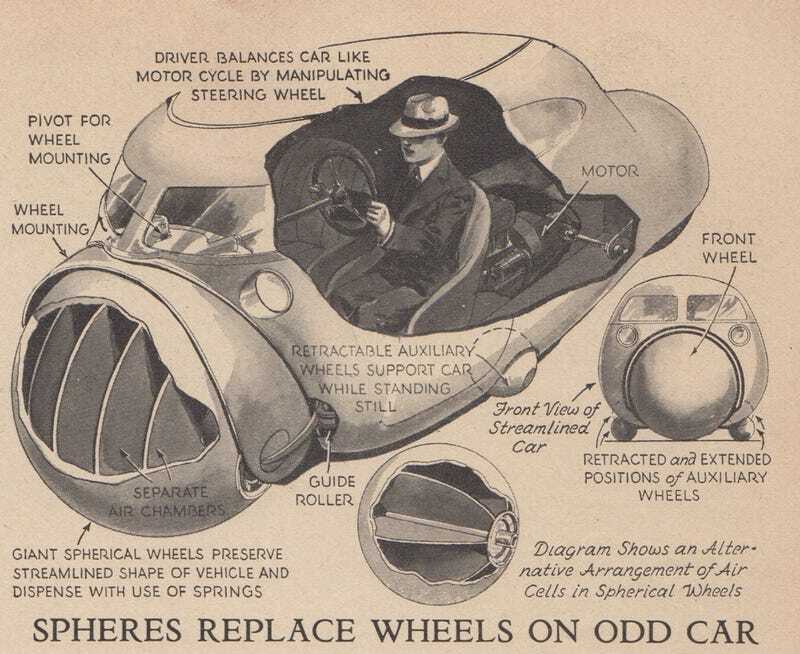 Between flying cars and three-wheeled cars, the period between World War I and World War II had some interesting ideas for the future of automobiles. But this one may have been the weirdest. Who needs wheels when you’ve got giantic rolling spheres? The September 1935 issue of Popular Science included the illustration above, showing off the “streamlined” car of tomorrow. A motor car that runs on air-filled spheres, instead of wheels and tires of conventional form, is the invention of a German designer. All parts of the new vehicle, he maintains, merge into a highly streamlined shape, thus minimizing air resistance. The globe-shaped tires require no mudguards, and dispense with the need of springs to absorb road shocks, also reducing skidding and serving as bumpers in the event of collision. Multiple air chambers prevent sudden deflation, with its attendant dangers, if a puncture should occur. In the proposed design, the car runs on a pair of pneumatic spheres at front and rear, and the driver balances it like a motor cycle by manipulating a steering wheel. Small auxiliary spheres may be extended to hold the car upright while it is standing still or getting under way. The short article doesn’t include the name of this “German designer,” which was a surprisingly common convention in 1920s and 30s tech magazines—especially in publications like Science and Invention. But you really can’t fault people of the 1930s for having some impractical designs. Everything, and I mean everything, was supposed to be streamlined. From toasters to bicycles to even houses. Even if it wasn’t supposed to move, it was streamlined, because the future was fast. Or at least that was the idea. Honestly, the proposed car from Popular Science looks like an absolute nightmare to drive. How do those enormous spheres grip the road? Your guess is as good as mine. I suspect that if this thing ever got tested, and I haven’t found any evidence that it did, then there were a whole lot of accidents. But I suppose that even accidents were supposed to be streamlined in the 1930s vision of tomorrow. If you’re going to crash you better do it fast. That’s what the future demands.